When it's time to deliver the eggs from the chickens that scratch and peck among the towering piles of earth at Montpelier's Vermont Compost, Kaleigh Hamel, 19, and Ruby, 17, do the job together. Hamel is the brains of the operation, making sure the invoice is printed, acting as driver and interacting with staff at the eggs' destination, Hunger Mountain Co-op. Ruby does the heavy lifting. In the literal sense of the word, they're a team: Ruby is an American Mammoth donkey, and Hamel is an experienced teamster and trainer. Together, they wend their way down Main Street to the store, Ruby pulling the cart and Hamel holding the reins. The unusual sight elicits strong reactions, Hamel says. Many people wave and smile as they pass the slow-moving cart. A significant number swear and flip the bird at the egg drivers. "You need to keep your composure," she notes. 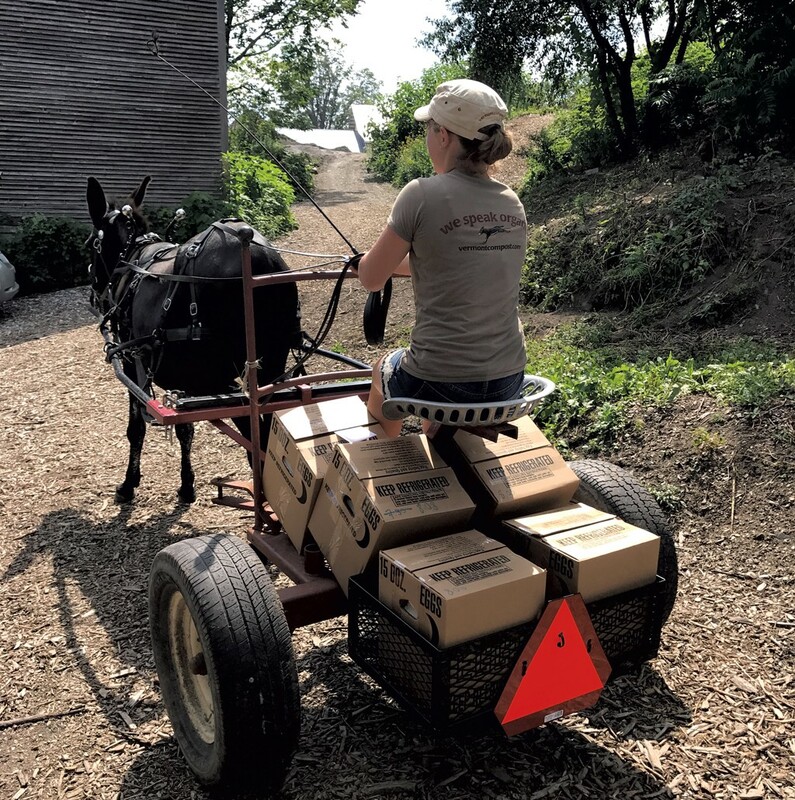 Why, in the age of mechanical vehicles, does Vermont Compost deliver eggs by donkey cart? Plenty of reasons, says the compost company's owner, Karl Hammer. There's the energy efficiency of fueling a delivery vehicle with grass instead of gas; there's a sense of urgency around the decline of heritage equine breeds; and there's the pleasure of working with animals instead of machines. "A tractor can never love you," says Hammer dryly. "There's something about working with animals that imparts a pleasure I've never derived from working with machines." Back in 1998, Hammer says, his staff collected Montpelier's compost with a donkey cart and five-gallon buckets. But, as demand for collection increased, it was hard to keep up. "We kind of degenerated to pickup trucks," he says. Now he's ramping up his animal-power program. "It occurred to us that we could deliver eggs and pick up food [scraps] around town," Hammer says. "We think there's enough density that it could provide pay for the teamster and hay for the donkeys. Pay and hay." Last year, Hammer began the search for a talented and experienced teamster who could both train the compost company's donkeys and mules and train other staff members to work with the animals. He got a call from Hamel, who grew up in Waitsfield and has been riding horses since she was 5. "I've always had the animal-whispery thing going on," Hamel says. When she was 11, she nursed an ailing barn cat at the neighboring Neill Farm back to health. Afterward, she stuck around and "became one of [owner Elwin Neill Jr.'s] little farm hands," she says. When Hamel, then 12, asked Neill "if he had some sort of project to keep me out of his hair," he offered her a team of 1-day-old oxen. "I went home and looked up what they were on the internet," she says, "and ordered myself a book." At Harwood Union High School, Hamel recalls, she was bullied because she didn't share other students' interests — or an inclination to "party and be up late." After her second year, she transferred to the Randolph Technical Career Center's program in agricultural technology, where she found her niche. "It was the most influential two years of my life," she says. By the time she was 17, Hamel's work with her oxen had caught the attention of people in the animal-power community, and she began to receive invitations to teach. 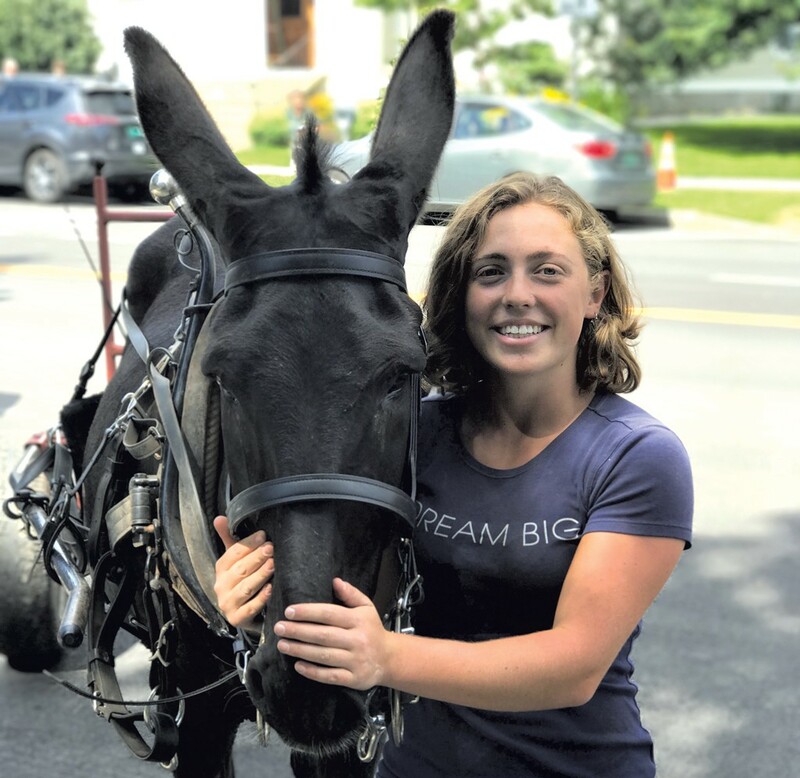 To date, she has done trainings for Tillers International in Michigan, the Draft Animal-Power Network of Vergennes and Sterling College in Craftsbury Common. "I want to teach people to work with animals ... and my business has just been growing and growing and growing," she says. In addition to the oxen, Hamel owns a team of Percheron horses. She offers education and training, takes wedding guests on sleigh rides, does trick performances "like a little circus act" and has even carried caskets at funerals. She has taught herself to trim equines' hooves. Now, says Hammer, Hamel has taken a shine to donkeys, which he describes as "more thoughtful than horses. Horses have [a] big lung capacity, and [when threatened] their first instinct is to run. Donkeys are more likely to think about [what to do]." As a result, Hammer continues, "Donkeys are less likely to spook. They're more stable about unexpected noises." Along with elephants, "they're seemingly the most intelligent of our domesticates," he adds. Some object to working animals on principle, but Hammer and Hamel take a different view. "Slavery is foul, but work is not," says Hammer. Just as humans are unhappy when they're sedentary, he says, so are animals. Being useful is psychologically beneficial for both. "Work is definitely fun for a donkey," Hamel agrees, although she prefers to think of their undertakings as play. "It's impressive how task-oriented they are. If you make your agenda really clear to them, and you both have the same goal, they become really engaged in wanting to get the job done and [doing] it correctly." In her work, Hamel stresses, the human and the beast are a symbiotic team, with the teamster requesting that the animal perform tasks and the animal responding. "It's really important to understand [each animal breed's] ways of thinking," she says. "We can utilize [that] to help them understand what we're asking them to do." For Ruby, she designed a training program with the assistance of an older mule named Katie. By pairing the two and letting Ruby see how Katie dealt with traffic, Hamel helped the donkey become road ready. The din of Main Street isn't a problem: Animals living at Vermont Compost, which has heavy equipment operating day in and day out, get comfortable around noisy machines. As tractors have replaced draft animals and as a result of "war and desertification," says Hammer, particular breeds have been dying out; worldwide, the population of donkeys has decreased over the last several decades. Hammer is a member of the Livestock Conservancy, which works to preserve valuable genetic stock. "The safest thing for an endangered livestock species is [to make] money for somebody," he says. "I deeply believe that this is plausible power for the future of Vermont, but we have to husband the genetics and the skill set." Hammer and Hamel are working together to consider all the economic possibilities that donkeys and mules can offer. For one thing, they're moving back toward regular compost pickups, which they hope to begin within a year, "as soon as we can get all of our donkeys in a row," says Hammer. That means having enough staffers trained to drive the cart, canvas wagon covers in case of rain and marketing efforts to promote the service. Hammer also likes to trifle with the possibility of donkey milk. "I've always joked about having a donkey dairy when I retire," he says. While the donkey milk may or may not materialize, delivering eggs is a regular gig. Today, despite thousands of years of draft animals pulling carts, it's a novelty. So is Hamel, a 19-year-old who's obtained senior teamster status while most of her peers are living in dorms. "She's a bit of a prodigy," Hammer says of her. "She has an extraordinarily upbeat work ethic. She's not grim about work; she has great joy in it. We're unaccustomed to people her age with that kind of focus." Watching Hamel with Ruby, that joy is evident. "Working together is a great way to build a relationship and to build trust," she explains. As Hamel gets the donkey ready to deliver the eggs — after Ruby is saddled but before she is hitched to the cart — Ruby inclines her head to share a snuggle, and Hamel nuzzles her and kisses her on the nose. Affection, Hamel says, is an important part of their daily routine and eases the twosome into the task at hand. And then they're off, with eggs in tow, clopping their way down Main Street. The original print version of this article was headlined "Hee Haul"